I can’t remember ever having a year when the hawthorn blossom didn’t fill the hedges till after the end of May. I guess we’re all getting used to the idea now that global warming doesn’t necessarily mean England will get warmer in the short term, just that we will get more extremes of weather. Still, it is a pleasure in June – it always comes eventually. Unlike some garden plants, most native species are well-suited to the vagaries of the weather, and many seem to have had a wonderful display of flowers this year. The Withybed buttercups were so spectacular that the man who came to service my boiler had to get out his camera and take a picture! The Village received a letter from a local commuter hoping that the station bank at Alvechurch wouldn’t be mown when the wild flowers were growing. I mentioned this last month – it would look so good (and save them money) if they left it until the end of summer. On my way back from submitting this article, I found the flowers, which were at their best, had been mown down. Perhaps we need a concerted campaign to get London Midland to take notice? I have, though, had very productive discussions with the contracts manager from the Canals and Rivers Trust about managing the towpath in a wildlife-friendly way. He has agreed to amend the mowing regime slightly, and it looks lovely at the moment – just a narrow strip mown, with flowers allowed to grow either side. They are also surveying the hedges along the canals, hoping to improve them. I was told there were lovely wildflowers this year on the Black Patch near the church, but by the time I got there it had been mowed down. Even one of the supposedly protected verges at St Kenelm’s near Romsley had been partly mown this year. But it looks as if in general the county council have been mowing the road verges more wisely this year – just mowing a narrow strip and leaving the flowers to grow. Wildflower corridors in these sort of places are vital in these days of intensive agriculture. In summer, we have a great choice of fruit and vegetables from local growers. Nowadays we can get quite exotic things as well as the more expected strawberries and tomatoes. From the Hewell prison shop I have had red, green, yellow and purple peppers looking like a Mediterranean festival, along with aubergines and courgettes and multicoloured tomatoes just crying out to become a ratatouille. This combination of peppers, aubergines, courgettes, tomatoes and garlic can be used for so many dishes, all delicious – centuries of Italians and Provençals can’t be wrong! It’s strange to think that in my youth we didn’t eat all this: tomatoes were just something to have with limp lettuce in a salad or fried with bacon for breakfast, and we never saw peppers, aubergines or garlic. Yet they can all grow here. It was probably the food writer Elizabeth David in the 1960s, introducing us to French provincial cookery, then Italian and Mediterranean cookery (I still have the old Penguin books), who started it all. The colours suit even our summers. The herbs that go with these foods are also around now. Marjoram is a very common old English herb, growing wild in places by the roadside, and easily in your garden. The flowers are scented and beloved by bees. It is an oreganum, slightly different from the imported oregano we use, but very similar. This is traditional holiday time, so I thought I’d write this month about something not local – the produce of the sea. Fish is reckoned now to be one of the healthiest foods, having the protein and minerals of meat, but beneficial oils instead of saturated fats. It’s very difficult to find your way through all the intricacies of what is and isn’t sustainable as species become endangered through over-fishing. And the maritime environment now has to have protected areas too, just like land nature reserves. Fishing is, of course, our remaining mass hunting activity – wild creatures being caught and eaten. Now some of it is farmed too, with the same issues as land farming – is it organic, or is it treated against disease and parasites, and does it taste as good as wild? And as with hunting land species, at one time we took them in a way that always left enough for the next generation, but in the last century we haven’t. One of my memories from my childhood growing up on a farm on the coast was having a couple of fresh, stiff mackerel handed over, the reward for letting fishermen park their cars! I still love mackerel, one of the tastiest and healthiest fish. Unfortunately it’s recently slipped a bit in sustainability – I must have eaten it all – so it’s best eaten as a treat. It goes really well with tart fruit like gooseberries or rhubarb – perfect summer food. Fish is so much better fresh. 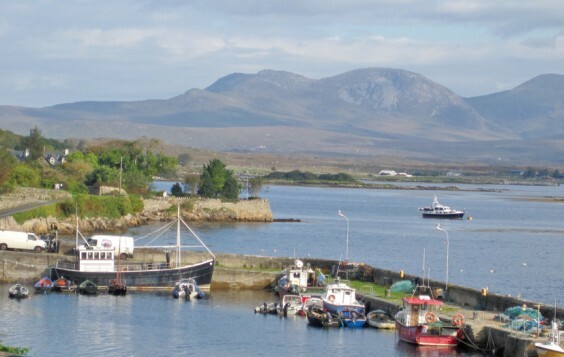 Last September I stayed with a cousin in Connemara, and her partner had brought in a huge bucket of spider crabs and mussels fresh from the sea. It’s tricky in the land-locked Midlands. Of course, at one time we would all have fished the rivers and canals, for food. There are huge pike and carp in our canal. Freshwater fish are a bit of an acquired taste, but they were all once useful when food was hard to come by. I have even seen them feature on trendy cookery programmes. Nowadays there is an outcry if anglers take fish for food, as some east Europeans have been reported as doing. You may not catch fish, but you may be able to find shellfish in rockpools along the shore. Most can be eaten – shrimps, winkles, crabs, cockles, mussels, even limpets. I remember spending a whole day as a child catching enough shrimps to make one small sandwich! But don’t take freshwater shellfish, such as our native crayfish, as they are protected. Smoking fish has had a big revival in recent years, and you can do your own. The best can be found in Scotland, Ireland and on the east coast of England. Each smokehouse has its own cure and it’s a delight to sample them. Cold-smoked or hot-smoked, all are delicious, though the high salt content means you may want to eat them in moderation. I bought some smoked wild salmon last year in Connemara, and the flavour of the fish was recognisably different. With fish come sea vegetables, as they are now called. Samphire is very trendy. There are two kinds, the rock samphire and marsh samphire, also called glasswort. Both have a crunch and a salty, sharp taste. Marsh samphire is the one often sold by fishmongers: you can eat it raw with smoked fish or lightly boiled or stir-fried with grilled fish. Rock samphire grows on cliffs and was often pickled. There are other good food plants growing on cliffs. Alexanders is in the carrot family and the young shoots are eaten like asparagus. (It also grows for some reason by a canal bridge near Alvechurch, possibly coming in on road salt). Sea beet is a much-eaten leafy plant, and there is a local variety of cabbage on the coast in north east England: Staithes cabbage. Pennywort is another seaside plant – round, fleshy, penny-like leaves – which goes well with fish. If you can’t get these, at least eat local freshwater watercress! Seaweeds of course have been a staple food in the past. Dulse and carragheen are still collected in Ireland and Scotland, and laver bread is a Welsh favourite. Again, trendy chefs have started to use them again. Japanese food makes much use of seaweed: it’s highly nutritious stuff and can be dried and kept. Seaweed wasn’t only used for food: it was the main fertiliser for growing food crops. On the Coigach peninsula in Scotland we could still see the remains of “lazybeds” – strips of ground fertilised by seaweed, used for potatoes and other basic vegetables. It’s especially good at breaking down clay soil, so we could do with some round here! I have just visited the new allotments in Alvechurch – a really inspirational place full of growing vegetables, with that wonderful architecture of pea sticks, bean poles, manure heaps and raised beds – and some fat rabbits, I’m afraid. No need for some of us to go to Evesham this year! The sea was one source of one of our key spices – salt. Sea salt is dried in “pans” and forms crystals. The most famous British kind is from Maldon, but you can now get it from Cornwall and Wales too. Salt is one of those things we find it difficult to do without. Remember the old folk tale in which the daughter tells her father “I love you as much as fresh meat loves salt”? He feels insulted until he is forced to live without salt, and then he realises how genuine her love is. For me, I couldn’t eat bread made without salt (I made it once by accident!). And we talk of the “salt of the earth” to mean essential people. In medieval halls, the servants sat “below the salt” and the gentry above it. The word “salary” comes from the word for salt. And salt played an important part in India becoming independent from Britain, when Gandhi stood up for the Indians’ right to their salt supply. We are warned now not to eat too much salt as it can raise blood pressure and cause heart problems. The main issue, though, is the amount of salt in prepared foods, especially snacks, which leads to over-consumption without you realising it. If you cook from scratch, you are unlikely to overdo the salt. Animals instinctively regulate their salt (and other mineral) intake: given a “salt lick”, cattle only use it when they need it. But we’ve lost our instinct in this, as in so many other things. Here, Alvechurch salt has left its mark. The “salt way” from Droitwich, a big salt-producing centre, runs through the village. You can still see where it went. It came along Stoney Lane to Cobley Hill, then branched off Grange Lane down through the fields on what is now a footpath to the bottom of Scarfield Dingle. There it now goes under the canal through a little aqueduct, crosses another field and then the railway. It follows what was called “Cobley Lane”, a little green lane behind the almshouses, and joins Station Road up to the church. It features in the July page of the Village Calendar this year. That reminds me, it is the August page of the calendar that has the non-deliberate mistake! The picture I submitted of a cornfield proved difficult to reproduce, so another similar one was substituted – but it’s actually a hayfield. I don’t think anyone has noticed, but I wouldn’t like you to think I don’t know a cornfield from a hayfield. Back to the Salt Way. It has some of the best wild flowers in the immediate area, in the old pasture land leading down to Scarfield Dingle. This field also shows signs of ancient cultivation patterns, and has a peculiar old water tank which once supplied High House Farm near the church. At this time of year you can find lady’s bedstraw, lady’s mantle, agrimony, betony, knapweed, tormentil, self-heal, moon daisies and acres of buttercups. In Cobley Lane are some lovely damsons, which should have set fruit by now. Most of our other spices were and are imported: pepper, nutmeg, cinnamon and all the rest were highly-prized and highly-priced. That’s perhaps why we associate them with celebratory foods, like Christmas puddings and hot cross buns. They were a key element in trade with the middle and far east right back to Roman times. One we can grow, though, is saffron, which is the stamen of a particular crocus. We even have a town named after it, Saffron Walden in Essex, where the production was concentrated, though it was also grown near Bude in Cornwall. Cornwall has traditional saffron bread, buns and cake, which I especially remember having at the funeral feasts of both my parents – it seemed to be impossible to have a funeral without them! I used to bring saffron flour back with me when I visited. Slow Food UK has included saffron cake in its list of “forgotten foods” which it is saving for the future. Unfortunately, the similar meadow saffron (colchicum), which looks like a crocus but isn’t one, is poisonous. That does grow round here, in Eades meadow. Go there at the end of August and you’ll see one of our real old meadow flowers in abundance. Go there in July and you should still see the June flowers, which look like being gorgeous this year. I have taken groups walking there, and round Penorchard meadows, and Alvechurch churchyard recently, and we saw lovely displays of May flowers during June! Round their peat fires like white bones. Owned by a dead hand over the sea. Among the ghosts of fishermen who moved away. Yet it is warm as a turf fire, welcoming. Life and survival bred into their bones.